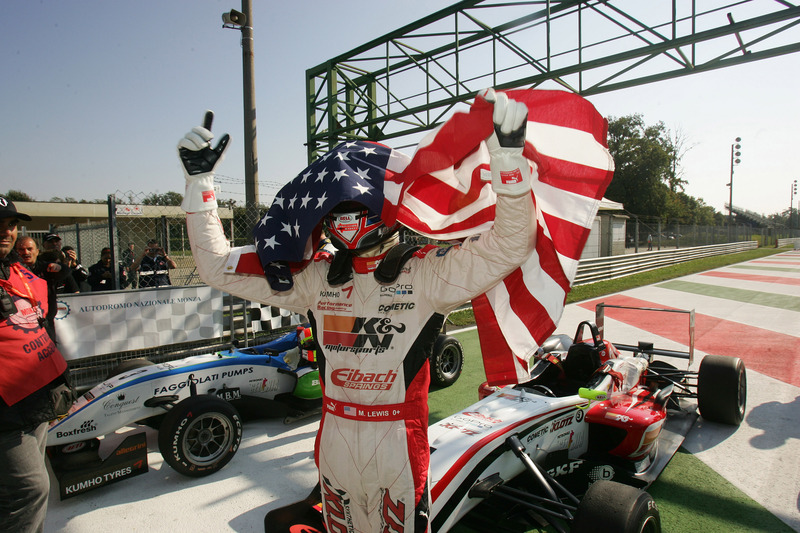 15/10/2011 - Michael Lewis obtained a strong victory and the fastest lap of in the eighth and final round of the Italian Formula 3 Championship in Monza, at the end of a race that awarded spectacle and overtaking only at his back. Thanks to the points harvested today the American driving for Prema Powerteam does not have to wait until Sunday for getting the rookies title and the hat-trick of pole position, fastest lap and victory in race one allow Lewis to stay in the fight for the absolute title. The classification leader, Sergio Campana, obtained a second place useful to keep a wide margin with a lot of grit and fighting with a group chasing him. This is not yet enough to secure the championship leadership and Lewis is the only contender left. The third step of the podium went instead to Maxime Jousse (BVM-Target) who fought a lot with team mate Campana and with the Brazilian Victor Guerin (Lucidi Motors), with the latter being fourth at the finish line after recovering in the early stages up to the second provisional position from the seventh on the grid. Brandon Maisano (BVM-Target), was another protagonist for the podium fight but ended in fifth position ahead of his fellow-pupil of the Ferrari Driver Academy, Raffaele Marciello (Prema Powerteam), sixth after spinning early in the race. Andrea Roda (Prema Powerteam) was seventh ahead of Simone Iaquinta (JD Motorsport), with the latter author of a spectacular off track excursion at the Lesmo corner; Edoardo Liberati (Team Ghinzani) ended ninth after being forced to a pit stop. Federico Vecchi (LineRace-CO2 Motorsport) has been forced to the retirement at the penultimate lap after helding the eighth position. The appointment is now for tomorrow at 10 (local time, GMT+2) with live coverage on Raisport 2 where the 46th Italian Formula 3 Champion will eventually be crowned. Lewis is ready and at the start he is first while sparklings animate the mid pack where Marciello spun. At the first chicane Lewis was at the lead followed by Jousse and Maisano with the latter shortly being overtaken by Campana and Guerin. Cheever went wide at Roggia and risked to take off touching the kerbs while his team mate Giovesi pitted. At lap two Guerin overtook Campana and got the third place behind Jousse, while Lewis put the hammer down and gained a security margin. The fight was then moved to his back where at lap four Guerin overtook solidly the Frenchman at Parabolica with the latter forced to La defend himself from Campana and Maisano too. Four drivers were battling the second position out with Guerin not managing to pull away from the BVM-Target trio with Jousse, Campana and Maisano battling strongly. The hottest duel is that involving Jousse and Campana with the Modenese managing to find the right move at lap eight but the Frenchman managed to get back his position. Behind them Marciello climbed up to the sixth place overtaking Roda, while the duel for the third step of the podium started getting more and more interesting. After several positions exchange Campana managed toe overtake the team mate during lap ten. At halfway through Lewis was strongly leading with eight seconds margin to Guerin that led Campana by a second and a half follone by Jousse, Maisano, Marciello and Liberati who is overtaken by Iaquinta before getting back into the pits to remove a safety cone stuck on his car as a consequence of an excursion. Campana started to push harder and at lap 14 he moved the attack to Guerin giving way at the first chicane. The Brazilian tried to respond to this attack but Campana defended his second position. Twists did not end there as at lap 16 Iaquinta went wide slipping down into ninth behind Vecchi. At the penultimate lap Jousse overtook Guerin while at the first chicane the South American responded back forcing the Frenchman in the runoff area. At the last lap the Frenchman got the third place back behind Lewis and Campana that consequently are the only two drivers still in the challenge for the Italian Championship.